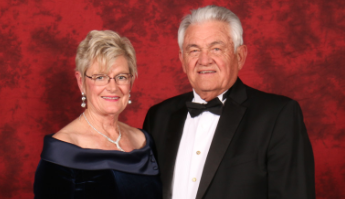 (Nov. 5, 2018 – DALLAS) — The Peter Hathaway Capstick Hunting Heritage Award Committee has selected Bill and Suzie Brewster as the 2019 Award recipients. The Brewsters will be presented with the prestigious award at the DSC Convention and Expo, Mogambo, at the Saturday evening banquet on Jan. 19, 2019. The Capstick Award honors the memory of a great man whose love of hunting and respect for wildlife fueled his desire to promote a hunting legacy that ensured the conservation of our wildlife resources. To pay tribute to Peter H. Capstick, award recipients have shown long-term support and commitment to our hunting heritage through various avenues such as education, humanitarian causes, hunting involvement, and giving. This year’s award winners, Bill and Suzie Brewster, epitomize these values and set a fine example as stewards of our hunting heritage. Together, they have taken hundreds of youths on their first hunts from deer and turkey to doves and geese, even bringing 10 to Africa for their first time. They have successfully owned and managed ranches for wildlife conservation in Texas, Oklahoma, New Mexico and Maryland, developing food plots, marshes, and a 20-acre lake for habitat conservation. Both extremely experienced hunters in their own right, Bill and Suzie have affected many even outside the hunting world. International communities have also received assistance from the Brewsters. When in Africa, Bill and Suzie provided extra funding for game scouts and anti-poaching efforts in several countries. They also generously provided first-aid, school, and sports equipment. This list expands greatly with their individual accomplishments. Bill Brewster shaped wildlife conservation on a broad level through his political and professional career as a U.S. House Representative and an Oklahoma House Representative, which led to him being the chair of several committees and councils such as Congressional Sportsmen’s Caucus, U.S. House Natural Resources Committee, and Oklahoma Economic Development Committee, to name a few. Most recently, he has been selected as the Chair of the International Wildlife Conservation Council, established by the U.S Department of the Interior, and is providing advice to the Secretary of the Interior. Suzie Brewster, the 2016 Outstanding Hunting Achievement Award (OHAA) winner, has spread knowledge of the importance of hunting heritage through various avenues. As an educator, she provided an influential role model for students for over 21 years in public schools, being recognized for excellence along the way throughout the state of Oklahoma. In 1999, she co-founded the Annual Congressional Staff Shoot. Bringing together approximately 100 Congressional staff each year, this event teaches and promotes shooting skills that the participants bring back to their home states. She currently serves on the NRA Women’s Policy Committee and helped initiate the Women on Target Hunting Program.